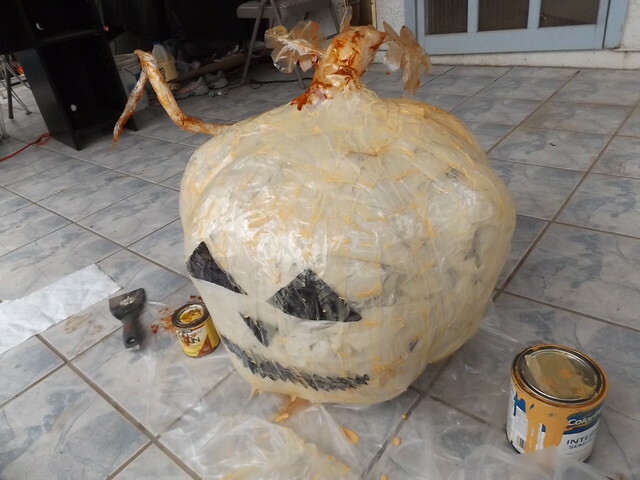 Last time I left off just as I added the stem/vine to the pumpkin. 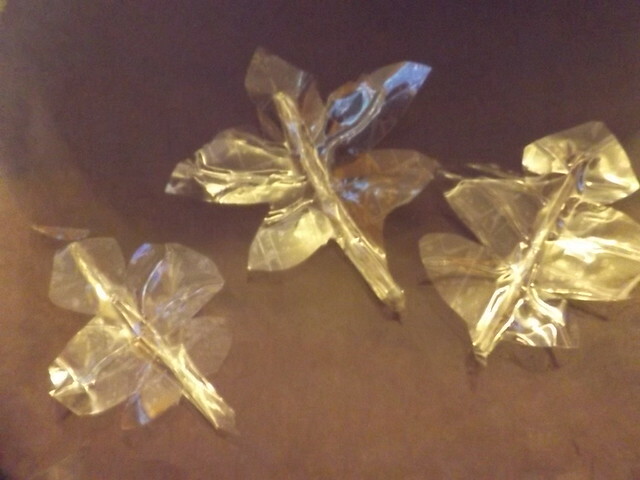 I did not mention that I decided to create some packing tape leaves. So, yeah, I know they are not botanically correct. They are, however, distinguishable as leaves, I think. 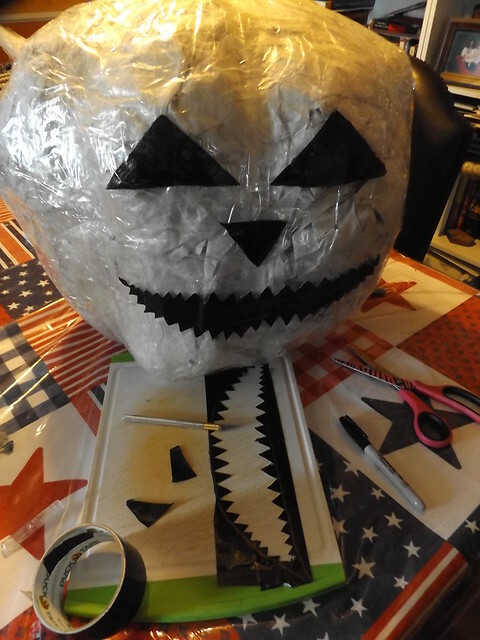 I then cut the final eyes, nose, and mouth out of black duct tape and positioned them. 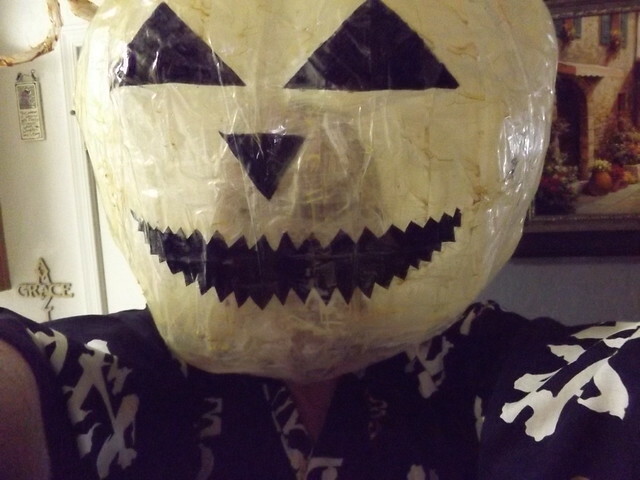 Once all the features were added, I added another layer of packing tape to the "face". At this point, I was worried that the thing was too transparent. The stufing was clearly visible within, and I was worried it would be too clear once removed. I thought it would help to add a wash of thinned orange paint to the body and some wood stain to the stem. This was 100% unnecessary. When I pulled the stuffing out, it was translucent but not transparent. The stuffing pressed against the sides fooled me. If I do another, I will not be adding this step - although, if I had some stained glass paint lying around, I might still be tempted to paint it orange. Not sure I like it too much as a mask. Visibility is even worse than I thought it would be. With a handler helping out, it would be doable though. B) you could probably get away with using just one roll of 109 yards. 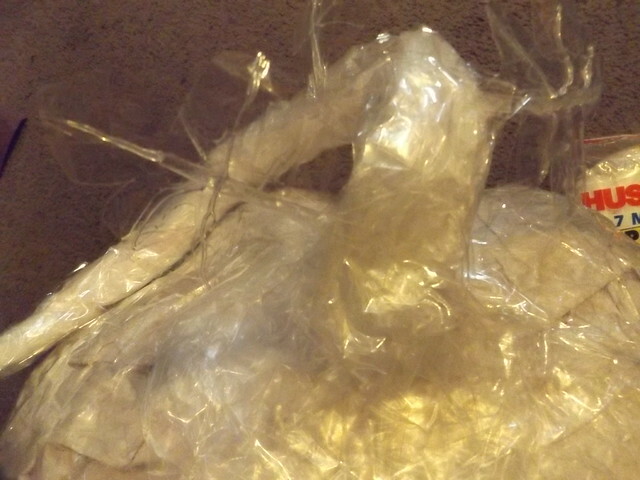 I also only used three of the twenty clear garbage bags, so I still have tape and bags to do one more, or to make a more traditional packing tape ghost. 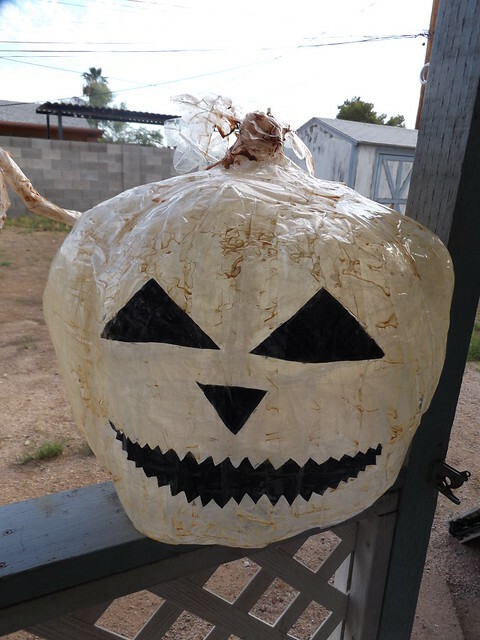 I have enough clear bags to make another several more pumpkins. Naturally, I still have all the paper I pulled out of the original form, too. 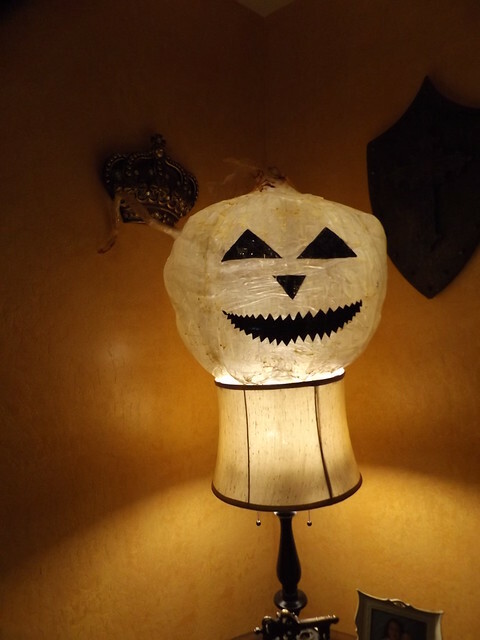 So one could easily make two of these for about $15-$16. 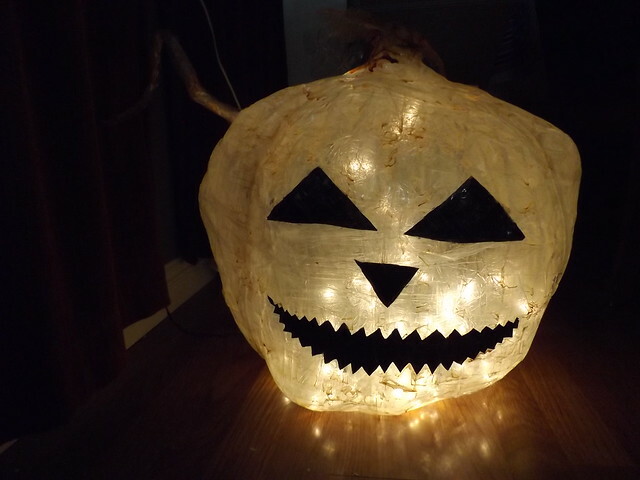 After that, you should only have to buy a roll of tape for the next 6 or so, if you want an army of ghostly giant Jack o Lanterns! The end prodct as shown is lightweight, and could be easily crushed. That said, its low weight would make it easy to hang from overhead, or to put on a popup mechanism. It has enough structure to sit uprigth and not collapse under its own weight, which was a goal here. I'd love to see what you do with it.